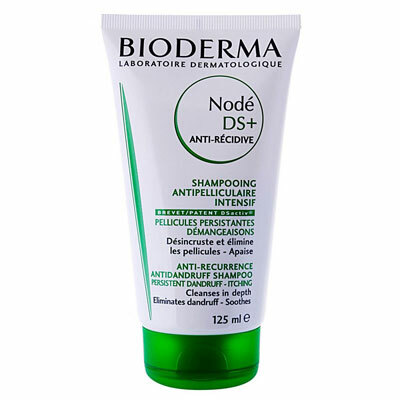 BIODERMA NODE DS+ SHAMPOO 125ml Anti-recurrence and antidandruff shampoo Description The exclusive formula of Nodé DS+ makes it highly effective against persistent dandruff. The patented DSactiv® complex guarantees double effectiveness, thanks to its action on the origins of flaky scalp: It limits the proliferation of the Malassezia yeast that causes dandruff. . It helps prevent recurrence by minimising the sebum secretion that promotes the development of Malassezia. Powerful keratoregulatory active ingredients help clear persistent dandruff and activate its elimination. Enriched with soothing ingredients, Nodé DS+ immediately and durably relieves itching of the scalp. The "fluid cream" texture is easy to apply. Nodé DS+ makes hair easier to detangle and improves shine, suppleness and volume.